From 1st February 2015, rules for motorcycle riders will be changing in the Australian state of Queensland. The Queensland government say that these changes will include allowing fully licensed motorcycle riders to legally lane filter, ride on road shoulders and in emergency stopping lanes, and giving all motorcycle riders a greater choice of helmets. While filtering has been to the fore front, the changes on helmets is less well know, although we have been aware of the issue for some time. Before this change to helmets made to United Nations Economic Commission for Europe (ECE) 22.05 standard, helmets that we wear here in the UK and across European, where basically illegal to wear in Australia. The announcement includes changes to how riders can control their bikes: the strict rules about where riders must have their hands and feet have been removed. Riders will also be able to enter a bicycle storage area as long as they give way to any cyclists or motorcycle riders who are already there, in other words shared space for parking. Lane filtering is when a motorcycle rider rides at low speed between stationary or slow moving vehicles travelling in the same direction they are riding. Motorcycle riders who hold an open licence for riding a motorcycle will be allowed to lane filter at speeds not greater than 30km/h between stationary or slow moving vehicles travelling in the same direction as them, provided it is safe to do so. Lane filtering at speeds greater than 30km/h (sometimes known as lane splitting) and lane filtering in school zones during school zone hours will remain illegal. 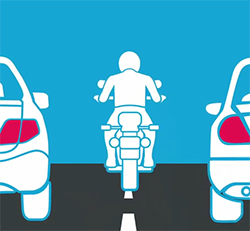 To see these rules in action, view the – Lane filtering in Queensland – video. Motorcycle riders who hold an open licence for riding a motorcycle will now be allowed to ride on road shoulders and in emergency stopping lanes on major roads such as highways, freeways and motorways where the speed limit is 90km/h or more. 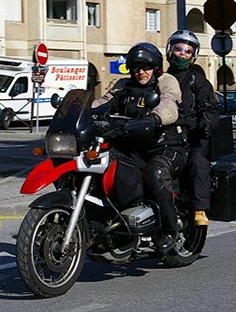 Motorcycle riders can ride past stationary or slow moving traffic at speeds not greater than 30km/h on the road shoulder (the sealed area of a road to the left or right of an edge line). Motorcycle riders must give way to cyclists or motorcycle riders already on the road shoulder. To see these rules in action, view the – Riding On Road Shoulders – video. Until now, riders were required to sit astride their seat facing forwards, ride with at least one hand on the handlebars and keep both feet on the footrests. Riders will still be required to be astride their seat but the strict rules about where they must have their hands and feet have been removed. The changes will allow motorcycle riders more flexibility on how they control their motorcycle. Motorcycle riders will now have more choice of helmets with the United Nations Economic Commission for Europe (ECE) 22.05 standard now being included in the approved helmet standards for Queensland. Previously, motorcycle riders on Queensland roads could only wear a helmet that complied with Australian standards AS1698 or AS/NZS1698. All motorcycle riders will be able to enter a bicycle storage area as long as they give way to any cyclists or motorcycle riders who are already there. This will allow them to move quickly and safely away from other traffic. ride in emergency stopping lanes on major roads where the speed limit is 90km/h or more. enter a bicycle storage area.